This recipe is extra fancy because of the lemon pepper linguini that I happen to have from the market we went to a few weeks back. 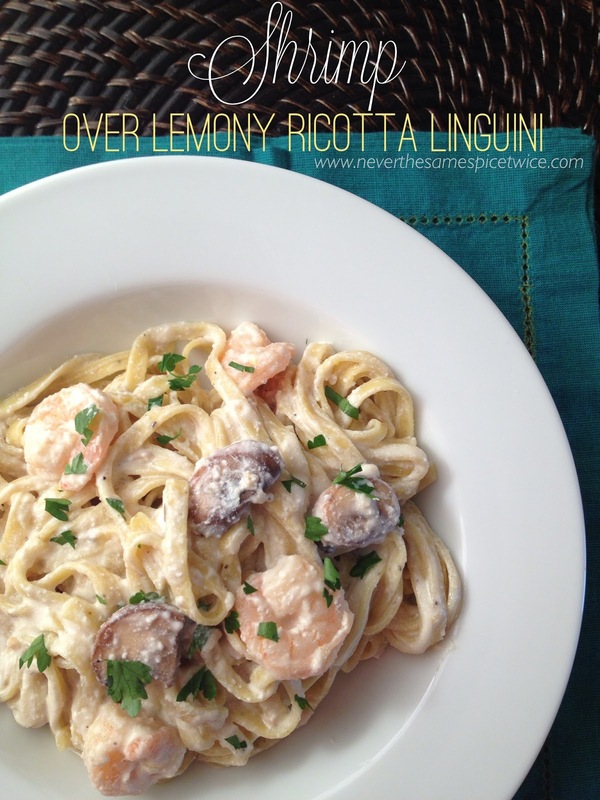 Of course you can make this with regular linguini, and I'm sure it will be JUST as fabulous! 1. In a saucepan over medium heat, heat extra-virgin olive oil & melt butter - cook mushrooms until they soften (about 4-5 minutes). Add garlic, lemon zest, lemon juice, and shrimp, cook until shrimp are pink (about another 7-8 minutes...may need to crank the head up a bit). Add salt, pepper, and red pepper flakes to taste. 2. Boil water, cook pasta according to directions. Save a few tablespoons of pasta water before straining. 3. In a seperate bowl, mix together ricotta, half and half, and parmesan cheese. 4. Turn the heat off of the shrimp sauce mixture and let cool for a few minutes before slowly adding the ricotta/half and half, and parmesan mixture into the pan, keep stirring until mixed evenly. Add a little pasta water if it is too thick. 5. In a large bowl, Pour shrimp sauce over the linguini....toss evenly so pasta is coated. 6. Sprinkle with fresh parsley, serve & enjoy!!! Lemon pepper linguine?! That sounds so good! That looks delicious although I'd probably do without the 'shrooms. Pinning it now yum yum! Oh my goodness, Stephanie.. my mouth is watering right now! YUM!! HALF Off ALL Ad Spots! SO MUCH to high five about! Friday...you STILL make me smile! What's coming up in my world?